Back in September, Twitter announced that they’d be redesigning the Tweet and follow buttons. As part of this change, the share counters has now gone away. The change caused a lot of complaints from marketers and others. Twitter offered a better explanation for why they’re making the change, though many still believe it’s simply a move to get more money or just plain screw them. 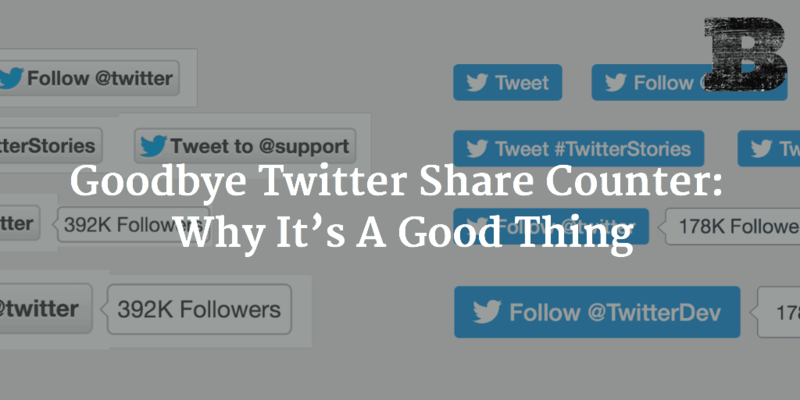 It’s not a bad thing that Twitter share counters are went away. It’s actually good. Here’s why you shouldn’t be sad to see them go. Ask someone why being able to see Twitter share numbers on a page is so important and the only reasoning they seem to be able to offer is that it’s social proof. The theory is that when people see an article has been shared a lot, it inspires them to share it too. This idea is based on the same psychology that causes us to get in line when we see others lined up, even if we have no idea what the line is for. Though many offer this reasoning and the idea behind it seems sound, I’ve been unable to find any proof that this is actually true. It seemed a test was in order. Testing was simple. With articles on a fairly popular website (one that sees thousands of views each day), we setup an A/B test. Half of visitors would see the articles with inflated social shares showing (shares in the thousands), while the control half would see the actual shares. Would the higher social share numbers cause more to share the article themselves? In our testing, the addition of fake shares to the share counter did not result in additional sharing by visitors (an increase of 5% or less). From these results, it’s clear that the social proof many claim exists doesn’t have the impact they believe. If we ignore our experiment, which showed that the share count does not impact the sharing of an article, let’s pretend for a minute that it does work. Imagine that high share count numbers do in fact influence more people to share. And thus, low share counts influence people to be less likely to share because, “If it wasn’t good enough for others to share then it isn’t good enough for me.” See the problem here? The vast majority of content on the internet hasn’t seen a ton of social sharing. Chances are most of the content on your site hasn’t been shared a ton. Unless you have content that sees very high sharing to begin with, the idea that share counters as social proof influencing additional sharing would mean that most of your content will never see that boost anyways. If social shares were so great at inspiring more sharing, everyone would be gaming them. We’d be installing fake social counts on our webpages and inflating them through other means. Anyone can buy a couple thousand retweets for a few bucks or setup a simple throwaway account that tweets your link over and over and over, in order to drive up the count. They’re also often inaccurately measured. Share counts also rely on searching for a very specific URL. If your URL is modified in any way, the share isn’t counted. Additions such as UTM and other variations in the URL, such as with or without www included, can cause a share not to be counted. Why rely on such an inaccurate form of measure? Studies have shown that almost no one uses social sharing buttons. Just 0.6% of desktop and only 0.2% of mobile users have ever used a social sharing button. So why would we believe that people will look at the social share buttons, check out the share count, and rather than click that button, copy and paste the URL into the social site directly or through other means instead? At the end of the day, success doesn’t come from share count. 10 shares or 10,00,000,000, your content isn’t successful unless people actually see it and it causes them to act in the fashion you desired. Social shares aren’t a sign of success. Even if your goal is awareness, a tweet doesn’t indicate that anyone actually saw or cared about your content. Plenty tweet anything on a topic of interest and there are countless options to automate the content curated for a Twitter stream. Stop measuring success in shares and start looking at how the content performed once people actually saw it. The death of the Twitter share counter shouldn’t be mourned. After investigating its real impact we find that the count meant very little all along and the removal won’t have a negative impact on your sharing success going forward (nor did it in the past either). Social sharing should be the result of a quality content, not simply a “me too” reaction because others have shared. With the sunsetting of the Twitter share counter, it’s now easier to ignore social shares as a sign of success and instead focus on the true indicators. Focus on real performance, not simply social shares.